We would like to share with you ‘The Fairy Tale of the Perfume Wizard and the Magic Coffee Beans’ – Once upon a time in the beautiful land of Perfume, there lived a Perfume Wizard that loved Perfume so much that he cast a spell so that every time you walked into a department store or through the departures lounge of an Airport, the Perfume Nymphs who worked for him would liberally spray you or the space around you in Perfume. Not just one type of Perfume but many, many different types, now for a while this made the Perfume Wizard very happy, but after a while he began to notice that the the people that he wanted to try his Perfumes, were becoming ‘Nose Weary’, and this made him very sad. So he decided that he must do something about it, he returned to ‘Perfume Land’ and spent many hours working out a way that he could overcome this problem. As he sat scratching his head and pulling his beard, while drinking a wonderful cup of Coffee that he had just made with freshly ground coffee beans. He came up with the fantastic idea of using ‘Coffee Beans’ to nasal cleanse or to put it another way give us an olfactory reboot, or the fresh impetus to try more Perfumes. Oh! how happy he and everyone else in Perfume Land’ were that they had solved this sniffy problem. However as we said at the beginning of the post this is, The Fairy Tale of the Perfume Wizard and the Magic Coffee Beans. The reason for writing this blog is in answer to the question we are asked time and time again on numerous occasions, “Does smelling or sniffing Coffee beans when you are trying or sampling perfumes work?”. 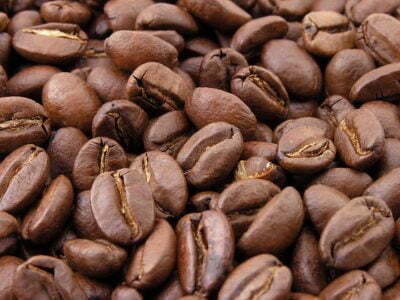 One of the most persistent myths in the fragrance sales industry is that of the ‘Coffee Bean’. You will have spotted or been offered a container of them at perfume counters through out the World , with the promise that they will re-set your nose or ‘cleanse your nasal palate’ in between trying out different scents. Before you rush to inhale deeply when offered the pot of magic beans, you might like to know that the number of aromatic compounds found in coffee is believed to be between 800 and 1000, and as analytical methods become more precise, no doubt even more will be uncovered. So if you thought you were experiencing so called ‘nasal fatigue’ due to the fact that you were trying so many different aromas, how does adding a further 800 to 1000 to the mix help? Another very interesting fact and one that we have written about before, is that our sense of smell is so much more powerful than you could ever imagine, research done by the Rockefeller University showed that your nose can detect ‘One trillion’ distinct scents click here for further details regarding this topic. So the fact that your sense of smell and your ability to detect so many different aromas is so well developed , then it is highly unlikely that even though you may have gone on a ‘Smell-a-ton or a sniffathon’ that your nose has become exhausted. However you may well have become psychologically fatigued, and feel as if you can not try a single note more, your nose that wonderful unique sensory organ however is rearing to go, in fact it never technically switches off. The technical term for what you may be experiencing is ‘Olfactory Habituation’, this is the ability of our olfactory system to take any initially strong and consistent smell and deal with it, by firstly registering and recording it and if it poses no danger then pushing it into the background so that we are aware of the next chemical aroma that comes our way. Most of us are already aware of this even if we have not thought about it in this way, it is the reason that we think or feel that the perfume we are wearing is not noticeable or does not last. ( There are some perfumes that do not last very long, but that is a story for another day). So what should you do if you feel overwhelmed or tired of smelling perfumes. Thankfully studies by scientists such as Dr. Alexis Grosofsky of Beloit College’s Department of Psychology, have provided research to prove that coffee beans have no more effect on cleansing your olfactory palate than a breath of air or a lemon slice. Following the completion of nine trials, where participants smelled three fragrances multiple times, rating odours each time and in between each trial sniffing coffee beans, lemon slices or plain air, the participants were asked to indicated which of the presented fragrances had not been previously smelled. Coffee beans did not yield better performance than lemon slices or air. So the moral of the story is that although the idea of ‘The Magic Coffee Beans’ is a fantastic marketing success, in truth it is no more or less effective than smelling a slice of lemon or good old fashioned air. Or another trick that we always recommend and use in the perfume industry is inhale or sniff your own skin unscented if possible, as it is much easier to find when you are in the middle of a wonderful store surrounded by Perfumes, and your local Lemon seller is never around when you need them!! At PAIRFUM London we can honestly say that we never tire of Perfumes or smelling them, and if you would like to try them then, please click here to find out more.